Coastal Mist Blog Hop Starts Today! I’m happy to be participating in the Coastal Mist Blog Hop! 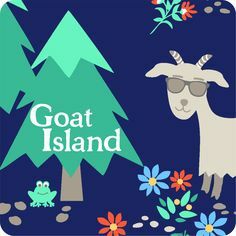 The hop runs January 23-February 4 and features the new Coastal Mist fabric line from Island Batik. My project will be featured on January 25th. Follow along and visit Tamarinis for a chance to win a Coastal Mist pre-cut bundle. On the wrong side of Fabric A, mark 1/4″ from each edge on all four corners. Next, place Fabric A, right sides together, with Fabric B. Fabric A will fit in between the marks. At the machine, select the 1/4″ seam. The Janome 9400 has 350+ stitches & alphabets built in, including a PERFECT 1/4″ seam setting in the “Quilt” menu – Quilt #2. NOTE: For the next step you will use the reverse button to back stitch at the beginning and end of each seam. Be careful not to reverse the stitch beyond the marked dot. Sew the seam beginning and ending at the marked dot. I like to tip the presser foot up and manually drop the needle directly onto the dot. Remove pins as you go and don’t forget to back stitch at both ends. Mark the opposite side of the unit, 2″ in from each side, and pull Fabric A to the edge and pin. Sew this side from dot to dot, back stitching at each end. Repeat the seams between the dots on remaining sides: Mark 2″ from each side and pull the corner of Fabric A to the dot and pin. You will need to scrunch the extra Fabric B out of the way and align the corner of Fabric A with the 2″ mark. NOTE: Extra Fabric B at corners out of the way, be careful not to stitch it into the seam. On the final side, leave a 3″ opening in the center of the seam to turn the unit right sides out. I usually mark with a different color pin so I don’t forget to stop sewing. This is what the napkin looks like now with all four sides sewn and a 3″ opening in one side. Fold unit diagonally and align raw edges of two sides. I put in a few pins to hold it in place. Next, place a ruler with a line on the fold of the fabric. Draw a line along the ruler edge between the end of the seam and the fold. 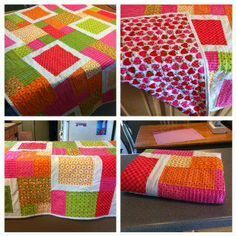 Change the stitch on your machine to Quilt #1. Sew on the line, stopping at the end of the previously sewn seam. Back stitch at both ends. Press all seams toward Fabric B. Turn unit right sides out and poke out corners. Press well. Top stitch Fabric B, close to the edge. This will secure the opening and finish the napkin. To make the covered button napkin rings you need a small square of fabric, a button cover kit and a hair band. Use the template provided and follow the directions on the package to cover a button. Put one end of the hair band through the loop on the back of the button and pull the other end through it. DECORATIVE STITCHING! For the next napkins I made I used a decorative stitch and discovered a fantastic feature on the Janome 9400! This stitch was very easy to sew by keeping the needle centered on the seam between Fabrics A & B. This is the first time I have used the Auto-Lock Button on the Janome 9400. When you get close to the corner you can push this button and the locking stitch function will stop stitching when the decorative stitch is complete. Then, with needle still down, lift the presser foot and pivot the napkin to begin stitching down the other side. This makes all of the corners of the napkin come out perfectly without any weird half-stitches in the corners. Yay! A few months ago, I got an email from Janome asking if I wanted to borrow and review their new Horizon Memory Craft 9400 QCP sewing machine. Ummm, YESSSS!!!! I have been using this machine on several projects and I like what I see. A lot. There are sooo many fabulous features on this machine that for this post I’m going to narrow it down and show you my favorites, including the Dual Feed Foot AD (the walking foot). As a professional quilter and former quilt shop owner, I have sewn on several types of sewing machines. I have to say that this is the best walking foot I have ever sewn with. It is easy to attach to the machine and is quiet, steady and smooth. The other thing that really knocked my sock off is the Retractable Sewing Light. In addition to the twin LED lights, this light extends on the front of the machine and really lights up your sewing area. I found this to be extremely helpful during some late night sewing sessions. It was hard to photograph how much light this baby provided, but trust me, it’s wonderful. And the best part is that it doesn’t get hot and make my sewing area uncomfortable. From the top… and not even extended all the way. You can also adjust the angle of the light to illuminate exactly where you need it. I think I actually giggled and clapped my hands when I discovered it! 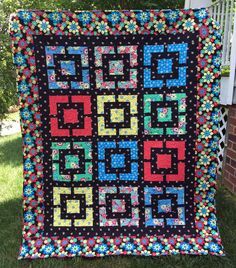 To show off my favorite features, I made a quilt-as-you-go table runner using the walking foot for the entire project, from piecing to quilting to binding. Before we start, I want to show you how I adjusted the needle to create a 1/4″ seam using the walking foot. I keep feeling like there may be a setting for this, but I just made the adjustment manually and started sewing. The default for the needle placement is 4.5. I adjusted the needle to a 9.0 and then ran the fabric along the right side of the walking foot. Once your batting and backing are secure, find the center of the runner and mark with a pin. 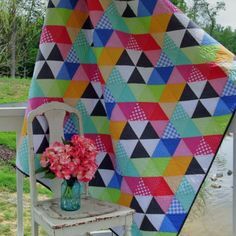 Find the center of your 1st fabric rectangle (this will be the center of the runner) and align both pieces with batting side up and rectangle fabric side up. Next, place the second fabric rectangle, right sides together on top of the first rectangle. Align the right side edges (mine happen to be the same size). Using the walking foot, stitch a 1/4″ seam along the right edge. Press toward the second rectangle. Continue to add remaining strips, in this same manner, on both sides of the center rectangle. Once you have all of the fabric rectangles sewn to the batting/backing, sew a stay-stitch across both ends to keep the final rectangles from shifting. For the decorative quilting stitches, select a stitch from the stitch menu. This machine has a tremendous amount of stitches – 350+ stitches & alphabets built in! You will also need a fabric marker and a scrap of batting with fabric on each side. I selected Quilting Stitch #22 and Decorative Stitch #48. I tested the size and shape of the stitches on my scrappy quilt sandwich. I liked them both. Next, I used my hera marker to mark the vertical center on my first fabric rectangle (center of table runner). The hera marker is great because it doesn’t actually mark your fabric, simply creases a line to follow. I started with Quilting Stitch #22. After stitching the center of the rectangle I followed the width of the foot from each side of the rectangle for stitch lines 2 and 3. Before changing stitches, I marked and stitched down the center of my narrower, white snowflake rectangles. I then used a straight stitch on the fabrics with prints, using the edge of the walking foot as a guide and the needle in center position. I also added a straight stitch to the narrow, white snowflake rectangles. I decided to add Decorative Stitch #48 to the center rectangle. When quilting is complete, trim the runner so the batting and backing are even with the top. Now it’s time to bind! I cut  2-1/2″ x width of fabric (selvage to selvage) strips of fabric, stitched them together using a diagonal seam and trimmed the excess fabric 1/4″ from seam. Next, I pressed the binding wrong sides together lengthwise. Before starting, adjust the needle position for a 1/4″ seam. Attach the binding starting in the center of one long edge on your runner. When you begin, start sewing with 8″-10″ of binding unsewn. Stop sewing 1/4″ from the corner of the runner. Fold the binding creating a diagonal crease from the corner. Next fold the binding back along the runner edge. I like to use a straight pin to get a clean fold on this edge. Once folded, remove the pin and pin along the folded edge of the binding. Continue to stitch, beginning at the edge of the runner. Continue to stitch each side, stopping 1/4″ from the corners and folding binding. When you get to the side you started on, stop stitching with at least 12″ of unsewn space between the beginning and end of the binding. Fold and crease the loose ends of the binding so they meet in the middle of the unsewn space on the runner. Trim the left side on the crease. Open this end of binding and lay flat. Here comes the tricky part. Twist the untrimmed side of the binding toward you, turning it over. Open the binding, wrong side up, and lay flat. Use a pen to mark the crease you created when matching up the bindings. Fold the end of the binding back, aligning the raw edge with the drawn line. Make a crease. Use pen to draw line on crease. Place this binding strip, right sides together, with the open end of the other binding piece. You may have to scrunch up the runner to get them flat together. Align the long edge with the end of the trimmed binding piece and the drawn line along the bottom edge of the trimmed binding piece. Be sure not to “untwist” the marked piece and pin both binding strips together. Next, sew on the diagonal drawn line. 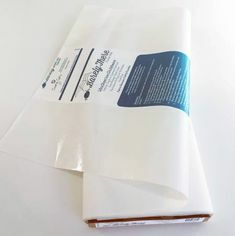 Scrunch the runner and keep it out of the way while sewing binding strips together. Untwist the binding to make sure it lays flat. Trim 1/4″ from seam and press seam open. Finish sewing joined binding to runner. Turn the folded edge of the binding to the back. Use Clover Wonder Clips to hold securely. Clip one long side. You can use pins for this, but I find they don’t hold as flat and even as the Wonder Clips. On the front of the runner, stitch in the ditch between the binding and the quilted fabric. Remove clips as you go. I like to start in the center and work toward the corner. 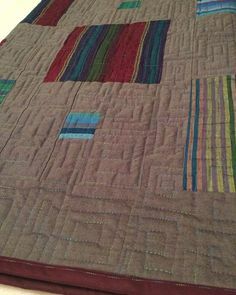 I turn the quilt and make 1 or 2 stitches into the corner to secure, then proceed down the next side. Check to confirm that you are stitching the back of the binding down. 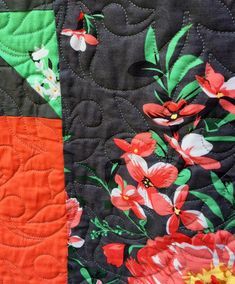 This is a quick binding technique and although the stitches show on the back, it looks hand-stitched from the front. We’re done! This was a fast and easy project and I can’t wait to try more decorative stitches on this machine! I made a table runner with this method for my daughter to use on her TV stand. Thank you to Janome for letting me use their fabulous machine! 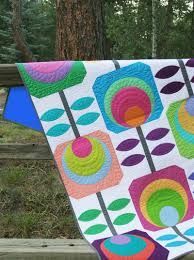 Look for another post soon showing more ways to use decorative stitches to spice up your quilting! Disclaimer: I was provided this sewing machine from Janome for my review. These opinions are my own and the walking foot provided the inspiration for this tutorial. If you’re in the market for a new sewing machine, I encourage you to check out the Horizon Memory Craft 9400 QCP. Pencil Me In is a mini quilt I designed for a friend last spring for an IG swap. 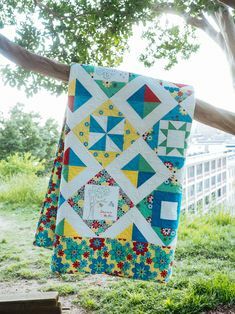 To celebrate back to school, fall and my general love of artstuff, I wrote up the pattern and made it in the amazing Paper Obsessed line by Heather Givans for Windham Fabrics. Click here to get the free pattern. Enjoy!